It can be hard to find a good toy for dogs that are a little rambunctious or that love to chew. We’ve researched and reviewed some best-selling dog toys designed to stand up to your canine best friend’s teeth and jaws! Before chasing down our reviews, check out the features to consider below. Caution: Always supervise playtime with a new toy to ensure your pet’s safety. Count - How many toys do you get? Look for a value-pack with multiple toys or just try out one at a time--your choice! Size - How big is the toy? Choosing the right size for your dog is important for a fun and safe playtime experience. FDA-Compliant - FDA-compliant dog toys are made with materials that you could eat off of, which some owners prefer! Floats - Look for toys that float if you want to play fetch and other games in the water as a way to beat the heat. Dishwasher-Safe - When your dog has turned a toy into a slobbery mess, it’s nice to be able to pop it into the dishwasher! Weight - Heavy toys may not work for smaller dogs or for taking with you on trips to the dog park or the beach. Ready to dig into our reviews of the top tough toys for dogs? Great! Our top pick and budget pick are our overall favorites, but keep reading for a variety of options that might be perfect for your dog. Let’s find a toy your dog can’t destroy! 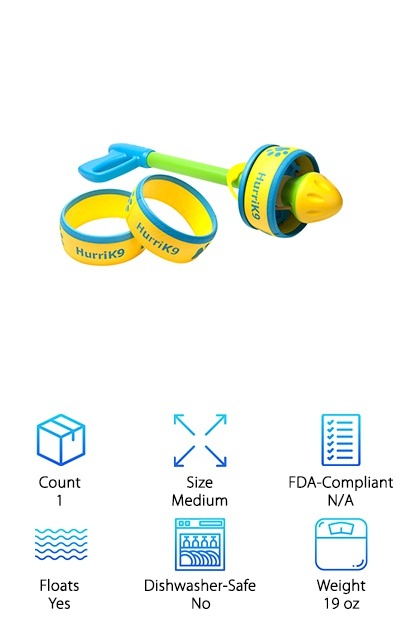 Playing fetch is one of the best ways to bust boredom and burn up some of your dog’s energy, and the HurriK9 Ring Launcher is designed to provide a fun long-distance fetching experience that’s easy on your arm and shoulder! The durable flying rings combined with the launcher make this one of the best heavy duty dog toys around. Choose between the Classic or Extra-Tough Ring designs. Each launcher comes with three rings that can fly over 100 feet with barely any effort on your part. The rings are tough but easy to catch without getting slobbery like a tennis ball. If your dog can’t get enough of playing fetch, it’s time to pull out the big guns: in this case, that’s the HurriK9 Ring Launcher! Keeping your dog mentally and physically stimulated can help keep destructive chewing and other unwanted behaviors to a minimum. And you can tire your dog out more quickly with the long launching distance of the HurriK9! Available in XS, S, M, L, XL, and XXL sizes to suit dogs from under five pounds to over 85 pounds, the Kong Classic is one of the best durable dog toys! This toy is made from dense rubber in a tapered cone shape that provides fun and unpredictable bouncing action for fetching games. 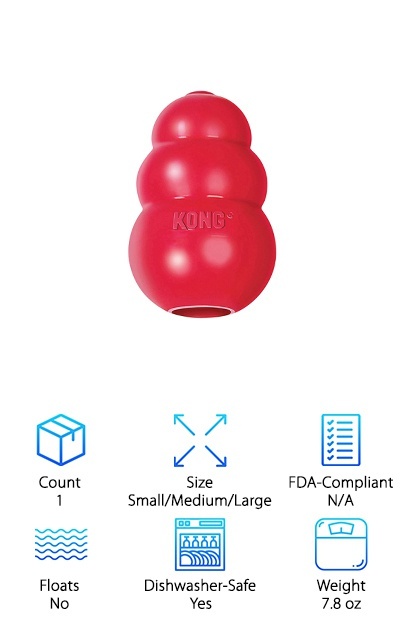 The Kong is made to be stuffed with treats--some dog owners even stuff the Kong with kibble for mealtime! Your dog will have to use their nose, paws, and jaws to coax treats out of the Kong, keeping them mentally stimulated and occupied while you do your thing. This toy is ideal for dogs that are “boredom chewers” since it can provide an entertaining and tasty alternative to destroying a kennel or living room furniture. Start out easy with dry treats, then try freezing a mix of kibble or treats with yogurt or peanut butter for a challenge! It can be hard to find heavy duty dog toys that can stand up to tug-of-war and fetching games when your dog has powerful jaws. The Zogoflex Bumi from West Paw Design is made in the USA and FDA-compliant, free from BPA and Phthalates. 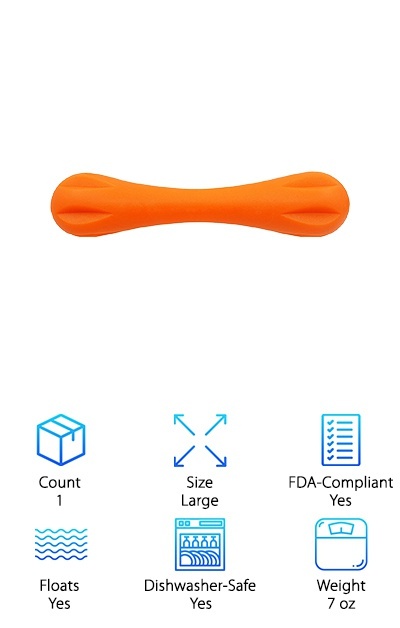 This non-toxic dog toy is in an S-shape designed for playing with a partner, whether that partner is a human or another dog. The toy stretches and bounces to make playing fetch or tug more exciting and interesting. The Bumi is available in small or large sizes and comes in bright colors that are easy for your dog to see against snow, grass, or water. Since it floats, you can use it in the pool or at the beach for some fun in the sun, too. And if things get messy, just pop it into the dishwasher! This is a high-quality and tough toy for dogs that love to fetch and tug. The Illuminating Dog Chew is made from BPA-free rubber with a squeaker and flashing LED lights inside. The LED lights flash when the toy bounces, helping to grab your pup’s attention if you’re playing fetch at night or in a low-light environment. The rubber is pliable and bouncy for a fun chewing and chasing experience. 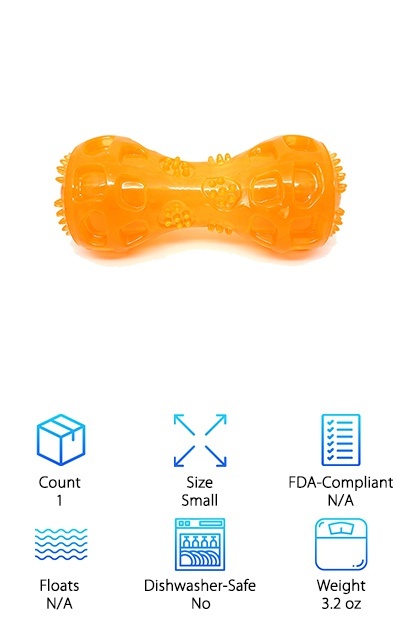 It’s made for chewers in mind with rubber nubs and grooves that help support dental hygiene. The bouncy rubber, squeaker, and LED lights all combine to provide an attractive, attention-grabbing toy for your dog. However, if your dog is larger or is an aggressive chewer, you may prefer a toy without LED lights if you’re worried about the dog chewing the toy apart. Cats aren’t the only pets that are entertained by lights! This toy should work well for puppies and small dogs, or owners who like to play fetch in the evening. Looking for heavy chewer dog toys that float? The Pet Ph.D Dog Chew is a great pick for dogs that love fetching in water. Take it into the pool or to the beach to give your dog something to do! This FDA-compliant rubber toy is non-toxic and recyclable and comes in bright colors. You can sanitize it in the dishwasher after a rough day of use since it’s top shelf dishwasher-safe! This heavy-duty rubber toy flexes for a satisfying chewing experience that medium to larger dogs will love. 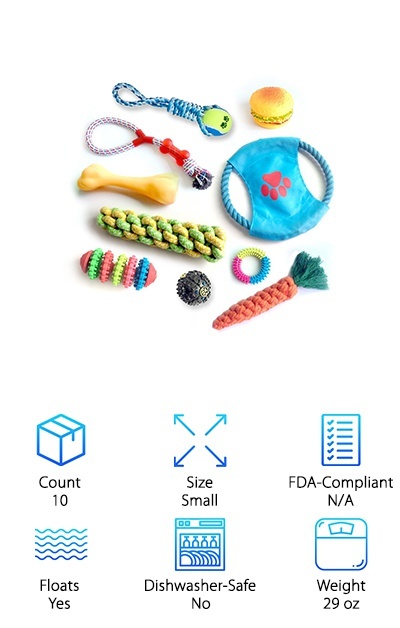 The FDA-compliant material makes it a good option for pet owners concerned about the contents of plastic and rubber dog toys, and the whole thing is warranted to last 12 months--if your dog destroys it before then, you can get a replacement! Overall, it’s a great long-lasting toy for fetching, tug of war, and chewing that’s made to be safe for your dog. This 10-pack of dog toys from Jofanza is perfect for entertaining multiple small or toy breed dogs or as a gift to new puppy parents. The mix of rope and rubber toys provide tons of options for entertaining a bored dog. Three long rope toys and a rope with a ball knotted on the end work well for fetch and tug-of-war. 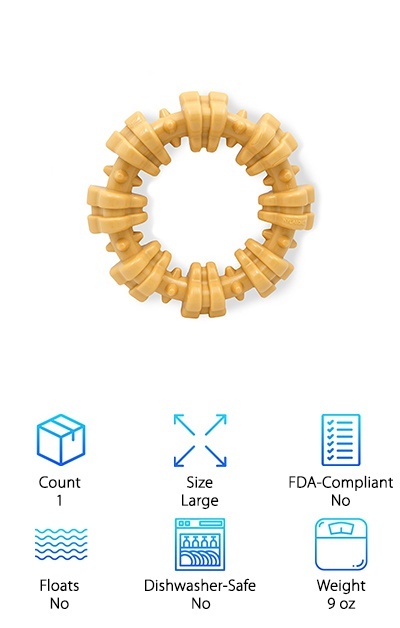 A textured rubber ring is included that can help teething puppies get relief. A squeaky bone and squeaky hamburger provide tons of entertainment, and a treat-dispensing ball and frisbee top it all off. The frisbee and squeaky hamburger both float, so you can take them along on outings by the water. The treat ball is a great little toy for keeping your dog occupied on their own and helps burn up some mental energy. 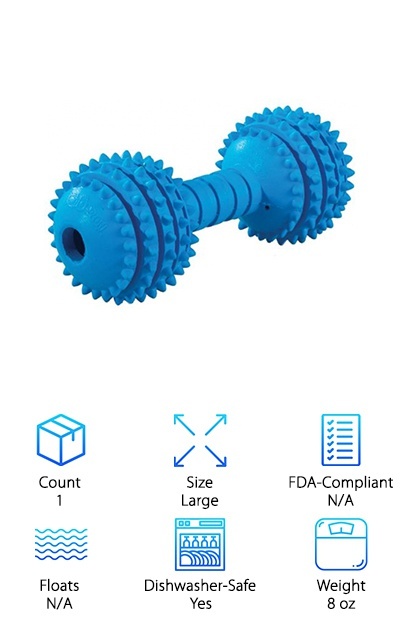 If you’re looking for a value-pack of dog toys for chewers that’s ideal for small and toy breeds, this option might be perfect for you! Kong is a great option for high-quality, durable dog toys, and the Kong Traxx tire toy is just another example of their tough yet fun toy designs! The Traxx tire toy comes in a small size for dogs up to 35 pounds and a large size for dogs up to 65 pounds--so if you have a giant breed dog, you may need to seek out a larger toy. 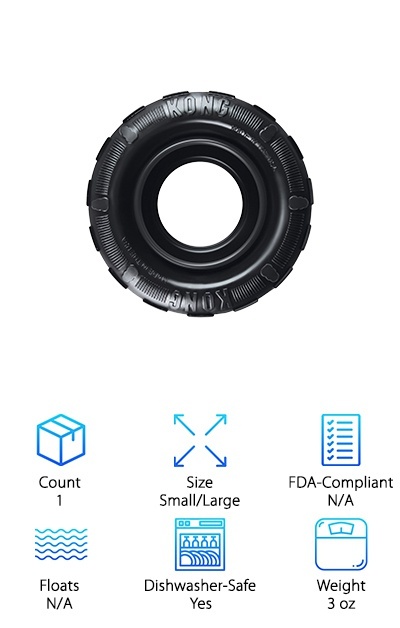 This tire-shaped toy is made in the USA from dense rubber that rebounds, resisting tearing and punctures. The treat-gripping design within the sidewalls allows you to amp up the fun when your dog needs to be entertained for a while. Stuff it with treats or smear some peanut butter in there to keep your pup occupied. It’s also a great toy for playing fetch thanks to the rolling and unpredictable bouncing action. This rubber tire toy can provide hours of entertainment for dogs who like to chase and chew! Have you made peace with the fact that your dog will inevitably destroy any toy you give him? Then maybe a chew toy that’s meant for eventual destruction is the best solution! The Nylabone DuraChew Power Chew toy features a fun textured ring shape flavored with chicken for an extra-tasty chew. Made in the USA, this nylon dog toy provides entertaining textures and bristles that help promote good dental health. It’s designed to hold up to aggressive chewers while keeping them interested in their “prey” thanks to the chicken flavor. It’s made for the jaws of large breed dogs 50 pounds and over. Although great for chewing, Nylabone products are not designed to be swallowed in pieces, so it does require some supervision. The DuraChew textured ring can be hand-washed with soap and water as needed. If your dog is a more mild chewer, check out the FlexiChew line! The JW Chompion rubber dog chew toy comes in small, medium, or large sizes for puppies and small breeds to large breed dogs. Made of 100% rubber that’s certified non-toxic, this durable toy has a ton of different possibilities for your chewer. 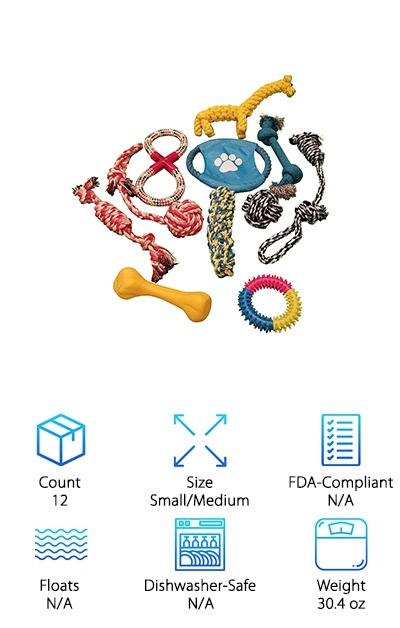 The nubs on either end of the toy provide a fun chewing sensation and help clean your dog’s teeth, and the dumbbell shape makes it fun to toss around and bounce during interactive play time. You can also stuff treats, peanut butter, and other goodies into the end of the dumbbell to send your dog on a solo mission to dig out every last bit! This rubber toy is naturally tough and is great for teething puppies or dogs that love a good chew. Especially powerful and destructive chewers may find the dumbbell design and nubs a little too easy to destroy. Small dogs need tough toys, too, and the PlayFur Pets Multipack is the perfect pick for your puppy or small breed dog with a destructive streak! This multipack of tough dog chew toys comes with twelve toys total, including nine braided rope toys, a rubber squeaker bone, a rubber ring, and a durable mini frisbee for playing fetch. The rope toys come in a variety of sizes and types with different knots, braids, and shapes to keep your dog occupied. You can play tug-of-war with one of the rope toys, toss the frisbee in the backyard, or throw the rubber squeaker bone indoors to help them burn off some energy. These rope toys and the rubber ring work really well for teething puppies and dogs who just love to chew. The variety pack makes it easy to switch the toys around to keep their playtime exciting.